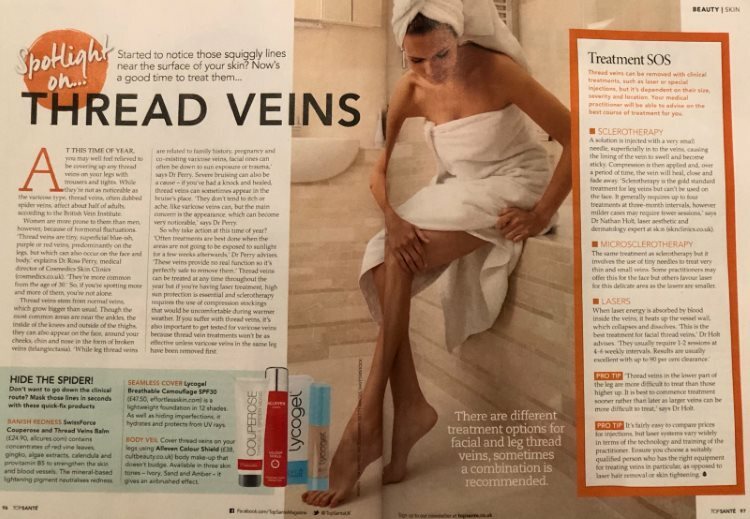 Top Santé magazine looks at the common problem of visible thread veins this month, with expert advice from Founder of The London Vein Centre, Dr Ross Perry, who is also a practicing GP. Top Santé suggests that winter is a good time to look at getting rid of troublesome and unsightly thread veins which are noticeable near the surface of the skin. Facial thread veins tend to be removed using laser treatment, following which clients are advised to wear a high protection sunscreen every day. The reason for this is to protect the skin while it heals. Sun damage is one of the primary causes of facial thread veins, so it is important to prevent it from causing new thread veins. Having this treatment in winter does not remove the need for sun protection, but does lessen the risk of accidental damage – with or without sun protection. Smaller leg thread veins can be removed using laser. Just like with facial thread veins, it is important to protect the skin from sun damage after treatment. However, in the cooler months, this is often done with clothing, as patients tend to wear trousers, leggings or tights with dresses/skirts. Larger thread veins tend to be treated using sclerotherapy injections. After sclerotherapy treatment, compression stockings are usually advised to help the blood to flow correctly and evenly. These can be quite warm in summer and also noticeable in shorter clothing. Having treatment in winter means that this is not a problem. The stockings can be quite cosy to wear and are not visible beneath trousers. Is it Safe to Remove Thread Veins? Dr Ross Perry tackled a very important question posed by Top Santé, something which many clients do wonder – whether it is actually safe to remove thread veins. Could it cause circulation or other vascular problems? Cosmedics Skin Clinics’ main London Vein Treatment Centre offers a range of treatments for thread veins for the face and body. Laser treatment with the Harmony XL Pro targets problem capillaries, vessels or veins with a blast of laser energy. This damages the veins so that they shrink, shrivel up and eventually disappear. Laser energy also works to stimulate healing and cell renewal in the treated area. Treatment using micro-cautery laser is also available at all of the company’s skin treatment centres. Sclerotherapy injections are recommended for larger thread veins such as those on the legs. With the addition of the Harley Street clinic in 2018, Cosmedics Skin Clinics now offer thread vein removal treatment at a number of Vein Treatment Centres in London and Bristol. Established in 2003, Cosmedics Skin Clinics offer treatment using the latest techniques with GMC-registered doctors and surgeons. They also offer advanced laser varicose vein treatment at the London Vein Treatment Centre.For more information or to book a consultation, please complete the form on this web page or call 020 7386 0464.